There are many pieces to the medical school application, including your GPA, MCAT score, personal statement, list of experiences, letters of recommendation, and biographical information. Use the navigation below to explore each aspect of preparing for medical school. Allopathic physicians receive a medical degree, or M.D. Allopathic physicians treat patients in a wide variety of specialties using prescription drugs, surgery, and preventative measures. Osteopathic physicians receive a Doctor of Osteopathic Medicine, or D.O. Osteopathic physicians receive the same medical training as allopathic physicians, as well as 200 hours of "osteopathic manipulative medicine" (OMM) training. Learn more about OMM from the American Association of Colleges of Osteopathic Medicine (AACOMAS). What makes a good osteopathic medical student? Podiatrists can work in a variety of health care settings including private practice, hospitals, and clinics. Podiatrists can specialize in orthopedics, sports medicine, surgery, pediatrics, diabetic wound care, and more. To prepare academically as a pre-medical student, you'll need to take the medical school prerequisites and coursework to prepare for the MCAT. 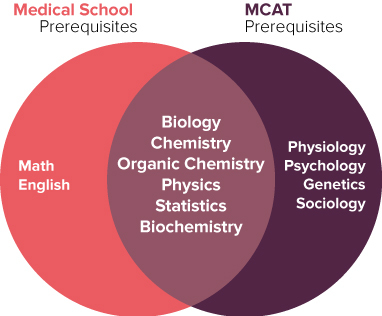 School prerequisites and MCAT prep coursework overlap but are not the same. MCAT prep coursework must be done before you take the MCAT and prioritized over non-MCAT prerequisites. You can choose any major and apply to medical school. If you choose a non-science major, you still have to take the science prerequisites required by most schools. Always cross-check your major requirements and the medical school requirements when choosing classes. Each medical school has different prerequisites. Some schools don't require any courses and instead use the AAMC 15 core competencies which can be found here. You can choose any major and apply to medical school. If you choose a non-science major, you still have to take the science prerequisites required by most schools. Always cross-check your major requirements and the medical school requirements when choosing classes. HPA recommends that pre-medical students maintain a minimum GPA of 3.0, although many medical schools will have GPA averages above this minimum. In the application process, medical schools look at your overall GPA as well as your science GPA. - For AMCAS, your science GPA or “BCPM,” GPA includes all Biology, Chemistry, Physics, and Math grades. Learn more about AMCAS course classification. - For AACOMAS, your science GPA includes Biochemistry, Biology/Zoology, Inorganic Chemistry, Organic Chemistry, Physics, and Other Science. Learn more about AACOMAS course classification. - For AACPM, each podiatric medical school has different prerequisites. Learn more about AACPM course classification. What are the Sections of the MCAT? What classes will help me with the MCAT? Each section of the MCAT will test different skills and knowledge that medical educators, physicians, medical students and residents have identified as key prerequisites for success in medical school and beyond. As such, different classes may be helpful for different sections of the MCAT. For C/P, it’s recommended that you complete a year of general chemistry, a year of organic chemistry, a year of physics, and a course in biochemistry. While there are no specific courses you must take for CARS, reading and writing-intensive courses can improve your CARS skills dramatically – as such, consider taking courses in UWP, ENL, or COM. For B/B, you should plan to take a year of introductory biology, a course in biochemistry, and a course in physiology at minimum. Additionally, consider a course in genetics, and a course in microbiology or cell biology. For P/S, you should take an introductory psychology course, and an introductory course in sociology. Additionally, consider taking a research methods course, as well as additionally upper-division coursework in sociology or psychology. It’s important to take the MCAT only when you are prepared to do so. Before beginning to study for the MCAT, you’ll want to make sure that you’ve taken courses that cover content that will be tested on the exam – this is often covered in your basic science coursework. To ensure that you’re ready, it’s recommended that you review the AAMC’s “What’s on the MCAT Exam?” tool to make sure you’ve covered all of the topics on the exam. Additionally, you’ll want to make sure you give yourself enough time to study adequately for the exam. People who do well tend to spend somewhere between 300 and 500 hours studying for the MCAT. Accomplishing this within a reasonable timeframe often requires finding a 10- to 12-week timeframe in which you can study full-time for the MCAT. Many people choose to take it in the summer the year before they apply. If you have questions about your specific MCAT timeline, please schedule an appointment with one of our advisors. * See HPA's Guide to Standardized Tests to learn more. You want to be a doctor. And we want you to succeed! So, how do you study for a test that is notoriously brutal and confidence-shattering? Click Here to access our MCAT study guide and get your game-plan going. The Princeton Review has flexible schedules, both online and in-person. Check out the courses at Davis Class Schedules. Enroll today with via our special partnership for the UC Davis Pre-Health Conference using Promo Code: UCDPHC1815 to save %15! MCAT Promo Code: UCDHPMCAT19 for 20% off the summer course! Whether you’re taking the MCAT, GRE, DAT, OAT, or PCAT Kaplan Test Prep provides prep, your way. Would you like access to free events such as practice tests and strategy seminars? Access our free events here! Are you considering a course? UC Davis HPA students receive $200 off of MCAT, GRE, DAT, OAT, and PCAT In Person, Live Online, or Self-Paced courses. Just use UCDAVISPH at kaptest.com to take advantage of this offer. Kaplan is also the official test prep provider for the PCAT. Asking, "Will this look good on a medical school application?" is the wrong way to approach your pre-medical experience. Medical schools will see who you are and what you care about through experiences that align with your interests, goals, and passions. Whatever you choose to do, be sure you are dedicated, passionate about it, and motivated to pursue it for the right reason! HPA recommends that you first build a strong GPA and gradually build up your experiences. This may require that you take some time off after graduating before you apply, but it is much better to apply later with a strong GPA than to apply early with lots of experience but a weak GPA. AMCAS opens in early May, but the first day you can submit your application will be in early June. You may enter up to 15 significant experiences with a 700 character count limit for each. You will have the opportunity to expand your descriptions further as there will be an additional 1,325 characters for three activities that you identify as the most significant. Choose a name for the experience or the title you held. If an experience had no explicit name choose a name that you feel best describes the experience. For each experience description, you should describe the nature of the organization or experience, what you did or accomplished, and if applicable, what you learned. It is important to describe your experiences clearly and positively. Try to use active verbs to describe your activities. Use numbers and figures to back up your descriptions when possible. Whenever possible, focus on achievements or special responsibilities. Use this space to describe the most meaningful experiences you have had. Quality is more important than quantity so do not worry if you have fewer than 15 experiences. - Early May: AACOMAS application cycle opens for submissions. - Mid June: Schools begin receiving and processing cycle applications. - Each school will have its own AACOMAS deadline, and most school deadlines fall between October and April. You can find a list of individual school deadlines here. The AACPMAS Application Service (AACPMAS) is the first stage of your medical school application. All podiatric medical schools participate in AACPMAS. AACPMAS opens in the beginning of August each year. You must apply the year before you plan on starting medical school. You can create an account in AACPMAS at any time, even if you aren't applying that cycle. AACPMAS will transfer information you input from one year to the next. You will designate all podiatric schools you're applying to in AACPMAS. The first school costs $180, and each additional school costs $45 each. Your personal statement should answer the question "Why do you want to go to medical school?" AMCAS allows 5300 characters for your personal statement. Your personal statement should not be a list of experiences. The Work/Activities section will be a list of your experiences. Use your essay to tell them something they do not already know about you. The personal statement is your first chance to provide medical school admissions committees with subjective information about your qualifications and your reasons for choosing a particular career. In other words, the personal statement is your initial opportunity to present yourself as an interesting and unique applicant who deserves a closer look. Your personal statement should answer the question "Why osteopathic medicine?" The formal prompt is the following: In the space provided write a brief statement expressing your motivation or desire to become a DO. AACOMAS allows 4500 characters for your personal statement. Your personal statement should not be a list of experiences. The Experiences and Achievements sections will be a list of your experiences. Use your essay to tell them something they do not already know about you. The personal statement is your first chance to provide medical school admissions committees with subjective information about your qualifications and your reasons for choosing this particular career. In other words, the personal statement is your initial opportunity to present yourself as an interesting and unique applicant who deserves a closer look. You will answer the following prompt in the "Essays" section of AACPMAS: "State below why you are interested in becoming a Doctor of Podiatric Medicine. Provide information about your development for a career in Podiatric Medicine. Your essay should be limited to 4500 characters." Your personal statement should not be a list of experiences. Use your essay to tell them something they do not already know about you. AMCAS allows you to report up to 15 meaningful experiences in the Work/Activities section of the application. You will have 700 characters to describe each of these experiences. Of the 15 experiences, you will choose 3 most meaningful experiences that were especially impactful. You will have an additional 1325 characters to describe these experiences. Experiences can include paid or volunteer clinical experiences, community service, extracurriculars, hobbies, publications, research experience, work experience, shadowing, leadership, and awards. You will have 600 characters to describe each of these experiences. You can add additional experiences after you submit your application, but you cannot update or delete completed ones. You need to keep track of the details of every experience you aim to include on the application, including the organization name, location, a supervisor's contact information, the date you started and ended, and how many hours a week you spent at this experience. HPA's Experience Tracker document can help you with this task. Most medical schools will require at least three letters of recommendation. Once a reference is completed on the AACOMAS application, it may NOT be removed or replaced. Research your schools' requirements before entering evaluator information in AACOMAS. Some schools may want letters mailed directly to them rather than uploaded to AACOMAS. Visit the Program Page in AACOMAS for each school you plan on applying to to see school-specific instructions. AACPMAS does not collect your Letters of Recommendation. You will send your letters directly to each school or use a letter service such as Interfolio or Virtual Evals. Supplemental applications are sent by each school you've applied to after the primary application has been submitted. Some medical schools will send a supplemental application to every applicant, while others will pre-screen the applicant pool and only send them to those who are most qualified. In most cases, supplemental applications contain additional short essays specific to that school. They can also include questionnaires, ask for a resume, or ask for a professional headshot. -How would you bring diversity to this medical school? -Why have you chosen to apply to this medical school? -Given our mission statement, what makes you a good fit for our medical school? -If you are currently not a matriculated student, please indicate what you have been doing since the time of graduation until now. -Is there anything else you would like us to know? -What makes you an unique individual? -What challenges have you faced? -Do you consider yourself a person who would contribute to the diversity of the student body? -Please use this space to describe any challenge or obstacle you have faced prior to your application to medical school and how you addressed that challenge. -Describe a time when you have made a decision that was not popular and how you handled this. -What else do you feel is important for us to know about you? Please use this space to highlight something not addressed in your application, including new experiences not in your AMCAS application. -What personal accomplishment are you most proud of and why? -Describe the steps you take to reduce your personal stress when confronted with difficult situations. -Describe the community in which you were nurtured or spent the majority of your early development with respect to its demographics. What core values did you receive and how will these translate into the contributions that you hope to make to your community as a medical student and to your career in medicine? What improvements do you think might make the described community better? -Please explain any inconsistencies in your university, graduate, or professional school academic performance and/or MCAT scores. -Has your college or university, graduate or professional school attendance been interrupted for any reason? If yes, please explain. Also, please explain any extended gaps in activity/employment in your post-graduate history. -Discuss any elements of your application that you feel might be concerning to the Admissions Committee. -Briefly describe the one clinical experience you have had that has most significantly influenced your decision to study medicine. Do not replicate your AMCAS personal statement. -Describe a meaningful interaction you have had with a person whom you have helped at work, school or another activity. -Discuss briefly why you have decided to pursue a M.D. degree program. -Are there any areas of medicine that are of particular interest to you? If so, please comment. Supplemental applications cost anywhere from $50-$120 per school. Some supplemental applications are sent by each school you've applied to after the primary application has been submitted, however some schools will have additional questions that serve as supplemental application questions directly on the primary application. Schools will have additional questions that serve as supplemental application questions directly on the primary application. Most medical school interviews take place between September and February. CASPer Testing: Click here to learn more. - What has been your best idea so far? - Walk me through a difficult decision you recently made. What factors contributed to your decisions? - Tell me about a time you led a team with members who did not agree with your decision-making. How did you resolve the situation? There are over 140 medical schools in the United States. See the AAMC's list of accredited schools. According to the AAMC, most applicants apply to around 15 medical schools. There are a variety of factors that go into choosing which medical schools to apply to, including location, environment (i.e. urban), tuition, class size, focus or mission statement, etc. Spend some time researching schools online and create a spreadsheet that tracks the factors most important to you. HPA also recommends meeting with an advisor to discuss your school list. Some schools accept a very small percentage of out-of-state students, while others only accept in-state applicants. See the breakdown of in-state vs. out-of-state applicants and matriculants. The Medical School Admissions Requirements (MSAR) database is a great resource to begin creating your school list. Click here to see where UC Davis students matriculated in the 2017 application cycle. As of February 2017, there are 48 osteopathic medical schools in the United States. There are a variety of factors that go into choosing which medical schools to apply to, including location, environment (i.e. urban), tuition, class size, focus or mission statement, etc. Spend some time researching schools online and create a spreadsheet that tracks the factors most important to you. HPA also recommends meeting with an advisor to discuss your school list. Spend some time researching each school online, paying attention to mission statements, class size, location, environment, and any other factors that are important to you. HPA also recommends meeting with an advisor to go over your school list. Download the 2017-2018 Podiatric Medical College Information Book for details about each school. International students are those requiring a student visa to remain in the United States to study. Applying to medical school can be more complex and challenging for international students, but Health Professions Advising and other campus resources like SISS can help you achieve your dreams of becoming a physician. - Not all medical schools accept international students. - Most medical schools require citizenship or permanent residency and a Bachelor's degree from a U.S. or Canadian institution. - Schools will usually only accept a very small number of international students each year, so the applicant pool is very competitive. - International students cannot receive federal financial aid such as Direct Stafford, Direct PLUS, and Perkins Loans. Learn more about applying to allopathic medical schools as an international student. - Not all osteopathic medical schools accept international students. See a list of schools that accept international students here. Learn more about applying to osteopathic medical schools as an international student. Podiatric medical schools accept international students. What's the difference between an M.D. and D.O. M.D.s attend allopathic medical school, while D.O.s attend osteopathic medical school. Both M.D. and D.O. physicians are licensed in all 50 states. They receive identical medical educations, except that D.O.s also learn osteopathic manipulative medicine (OMM), which involves hands-on care to treat, prevent, and diagnose disease. Both M.D. and D.O. students can enter any specialty of medicine. I am considering an MD/PhD. What do I need to know? There are over 100 MD/PhD programs, but not all are fully funded. Is podiatric medical school different than allopathic or osteopathic medical school? In recent years, the American Podiatric Medical Association pursued an initiative, called Vision 2015 - The Path to Parity, to ensure that podiatrists are universally recognized to be on par with allopathic and osteopathic physicians. Podiatric medical students receive the same curriculum as allopathic or osteopathic medical students that is no less rigorous or intense. One key difference between the three medical professions is that osteopathic medical students also learn Osteopathic Manipulative Medicine in addition to their other curriculum. Download the 2017-2018 Podiatric Medical College Information Bookfor a year-by-year breakdown of podiatric medical school curriculum. What is an osteopathic medicine? "​Developed more than 130 years ago by Andrew Taylor Still, MD, DO, osteopathic medicine brings a unique philosophy to traditional medicine. Osteopathic medicine focuses on the whole person, the relationship of the body’s nerves, muscles, bones and organs, and the body’s innate ability to heal itself. Osteopathic medicine is one of the fastest growing health professions, with one out of every five medical students enrolled in a college of osteopathic medicine. Osteopathic physicians (DOs) apply the tenets of osteopathic medicine to the prevention, diagnosis and treatment of illness, disease and injury. Osteopathic physicians are fully trained, licensed to prescribe medicine and practice in all medical and surgical specialties and subspecialties." Do I need to know what specialty I want to pursue right now? You do not simply "sign up" for the career in medicine of your choice. If you are interested in learning more about residencies, visit the AAMC or AACOM. However, you are not responsible for this information as a pre-medical student. I am an international student. What do I need to know? Learn more about applying to podiatric medical schools as an international student by visiting each school's website and viewing their requirements for international students. Which classes count towards the science GPA? You can see which courses count towards the science GPA calculated by AMCAS here. You can find a list of the courses that will be calculated into your AACOMAS science GPA here. You can see which courses count towards the science GPA calculated by AACPMAS here. To calculate your science GPA, pull up your Academic Record in OASIS. Along the left side of the course list, you will see boxes. Check off the boxes for the courses you wish to be included in the GPA calculation on the right side of the page. What courses satisfy the English requirement for medical schools? Lower and upper division English (ENL), UWP, and Comparative Literature (COM) courses will satisfy the English requirement for medical schools. You may also take similar classes at a community college. Note: Testing out of the upper division UWP course requirement via the Upper Division Composition Exam (UDCE) for graduation does not count towards the medical school requirement. If I repeat a course, does it affect my GPA? Every class that appears on an official transcript with a grade is calculated into your AMCAS GPA. For example, if you get an F in organic chemistry but retake it for an A, both grades will factor into your AMCAS GPA. Starting with the 2017-2018 application cycle, AACOMAS is no longer forgiving first instances of repeated courses. What does this mean? This means that every grade you have earned for a course will factor into your medical school application GPA. For example, if you get an F in organic chemistry but retake it for an A, both grades will count towards your GPA. Starting with the 2017-2018 application cycle, AACPMAS is no longer forgiving first instances of repeated courses. Learn more about this new policy. Should I take BIS 102/103 or BIS 105? Either BIS 105 or BIS 102/103 will adequately prepare you for the MCAT. Check your major requirements before choosing one over the other. Do medical schools accept AP Credit or Pass/No Pass courses? Medical schools are not consistent in how they handle AP Credit. In general, pre-medical students should take all prerequisite courses at a college level. Most schools will not accept P/NP classes to satisfy prerequisites. If I'm going to get a C- in a class, should I intentionally get a D or F in that class in order to retake it for a better grade? Do not fail a class on purpose in order to retake it for a better grade. Even though the lower grade will not be included in your UC Davis GPA, it will remain on your transcript and most centralized applications will count that first grade into your application GPA. Additionally, the health profession schools will still see it. It is better to have a C- in the course and improve through other courses in the same discipline than to take a D or F.
Most health professional schools require all prerequisites to be completed with a C or higher. Although you cannot repeat the C- at UC Davis, you will need to repeat it somewhere else either over a summer or after graduation. If you need to discuss this or any other academic difficulty futher, please make an appointment with a staff advisor. Can "study abroad" courses count as prerequisites? If your study abroad program was through UC Davis Study Abroad or UC Education Abroad (UCEAP), then your coursework will be on your official UC Davis transcript and fullfil prerequisites. If you studied abroad directly through a foreign institution, then your coursework will be on a "foreign transcript," which AMCAS does not accept. Learn more about entering study abroad coursework in AMCAS. If your study abroad program was through UC Davis Study Abroad or UC Education Abroad (UCEAP), then your coursework will be on your official UC Davis transcript and fullfil prerequisites. If you studied abroad directly through a foreign institution, then your coursework will be on a "foreign transcript," which most health professional schools do not accept. What should I do if I'm going to get a low grade in a class? Although no one wants a C, it is not the end of the world if you get one or two C’s. You can still get into a medical school. HPA recommends taking other courses in the same discipline to make up for a low grade. For example, if you do poorly in BIS 2A, take BIS 101 and do well in that. You may have heard that if you know you'll get a C-, you should take a D or F intentionally in order to repeat the course. HPA does not recommend failing a class on purpose in order to retake it for a better grade. Even though the lower grade will not be included in your UC Davis GPA, it will remain on your official transcript, will factor into your AMCAS GPA, and will be seen by medical schools. UC Davis will not allow you to repeat any courses in which you earned a C- or higher. However, you can retake the course through UC Davis Open Campus after you graduate or at another situation. Please keep in mind that you will not be eligible for financial aid through the FAFSA if you repeat classes this way; you must either pay out-of-pocket or apply for a private loan. Can participating in more experiences make up for a low GPA? In most cases, no. This idea is a common myth among pre-health students, but unfortunately no experience can make up for a GPA lower than 3.0. Most pre-medical experiences aren't going anywhere - you can always take a gap year (or more!) to do research, work as a scribe, volunteer, etc. - but you really only have one chance to do well in your classes here at UC Davis. It is much more valuable to graduate with a higher GPA and less experiences than lots of experiences and a low GPA. Taking classes to improve your GPA after you graduate is often a time-consuming and expensive process. Make an appointment with an advisor if you'd like to discuss your academics in more detail. Do I have to complete all of the prerequisite coursework before applying? No, you are not required to complete all of the required coursework before applying unless a school states otherwise. However, you should complete a majority of the science coursework before you apply. You must complete all of the coursework before you start at the health profession school. ﻿You should begin studying for the MCAT after you have taken all of the coursework that HPA recommends students take before the MCAT. Many students take the MCAT the summer before they apply to medical school. Consider making an appointment with an advisor to create an application timeline. 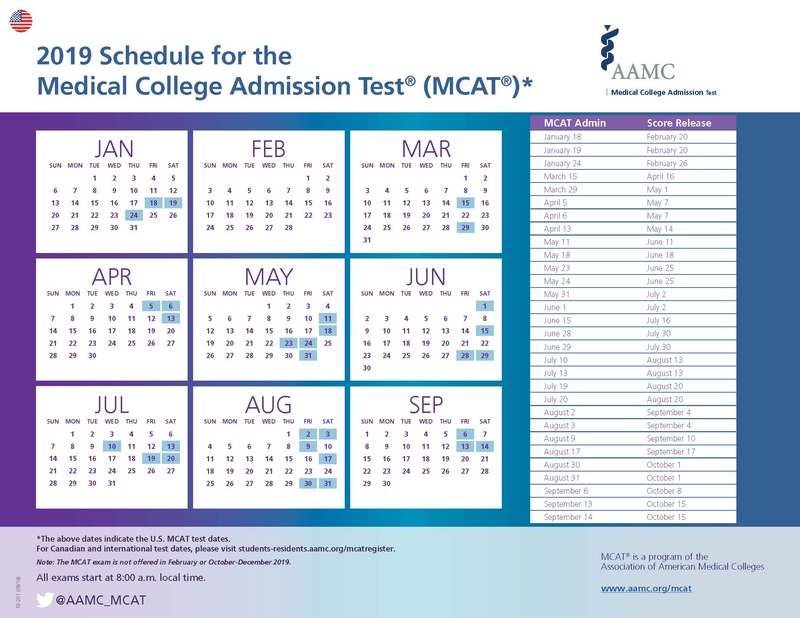 See the AAMC's MCAT Testing Calendar for this year's testing dates. When should I start studying for the MCAT? When you are taking your prerequisite courses, you are essentially studying for the MCAT. You should formally begin studying for the MCAT after you have taken all of the coursework that HPA recommends students take before the MCAT. Keep in mind that the new MCAT is 7.5 hours long. The test is a content test, but it is also an endurance test. You need to practice reading efficiently and coherently for long periods of time. If you struggle with reading comprehension or test anxiety, we strongly recommend that you address those areas before you attempt the test, such as through a SASC workshop. Do I need a test prep course? According to the AAMC, about half of MCAT examinees report that they used a test prep course to prepare for the test. Whether or not you need a course depends on how you study. If you prefer to study at your own pace, there are many resources available online to help you prepare for the test without using a company. Learn more about studying for the test. You will apply to medical school the spring of the year before you wish to start. For example, if you want to start school in Fall 2020, you must apply to AMCAS in spring 2019. You will apply to medical school the spring of the year before you wish to start. For example, if you want to start school in fall 2020, you will apply to AACOMAS in spring 2019. You will apply to medical school the spring of the year before you wish to start. For example, if you want to start school in fall 2020, you will apply to AACPMAS in spring 2019. There is no right or wrong time to apply, but you should apply when you feel most confident about your application. When you choose to apply is a very personal decision, and we encourage students to talk out their plans with an HPA advisor before settling on a timeline. Your gap year is a chance to expand and develop in areas you were unable to develop during your undergraduate years. What are advantages of taking a gap year (or years)? The personal statement should be a reflective, well-polished document. You can create your first draft as soon as you want. The more time you give yourself to get feedback and revise the better. The advisors at Health Professions Advising are happy to read your essay and give you feedback, but please make the appointment at least a month before your deadline. Please bring a printed draft of your personal statement to appointments and drop-in advising. "Holistic review is a flexible, individualized way for schools to consider an applicant’s capabilities, providing balanced consideration to experiences, attributes, and academic metrics. These factors are considered in combination with how the individual might contribute value as a medical student and physician. The use of holistic review by schools has increased in recent years and is becoming more and more common." 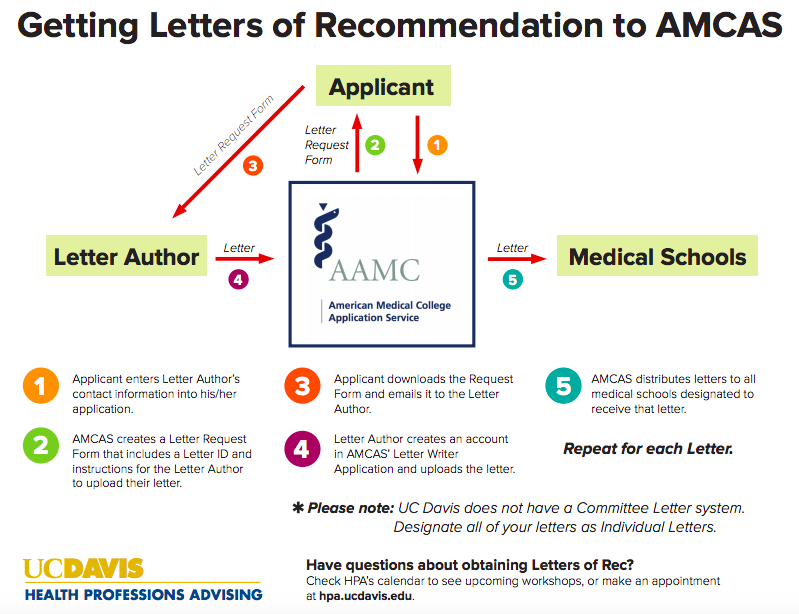 "Once you submit your application to AMCAS, you will receive an acknowledgment of its receipt via email (provided you have included a valid email address). Such acknowledgment does not indicate that your materials (i.e., official transcripts) are complete or that deadline requirements have been satisfied. The AMCAS Verification process starts when your application has been submitted and your official transcripts have arrived at AMCAS. Once all your materials have been received, your application joins the verification queue. Processing can take up to 6 weeks from the time that your application and all required official transcripts are received. During the Verification process, AMCAS verifies your coursework against your official transcripts, ensuring that the course information entered in your application matches that on your official transcripts. AMCAS may return your application to you—which could result in missed deadlines—if major errors or omissions in course listings are found during verification. AMCAS will stop verifying your materials and send an email notification if any missing or incomplete transcripts are discovered during verification."